After a mysterious attack wipes out the major cities of 19th century Japan, Korea and China, survivors from all three lands find refuge on a hidden island and build a new society. Hana, the orphaned daughter of Korean peasants, and Kenichi, son of a great samurai leader, have little in common except for a mutual disdain for the other. But these young warriors will have to work together when an army invades the island with shocking news: there is a new Shogun and the Island is expected to pay fealty in exchange for protection from a new enemy...a mutated horde that threatens to wipe out all humanity. 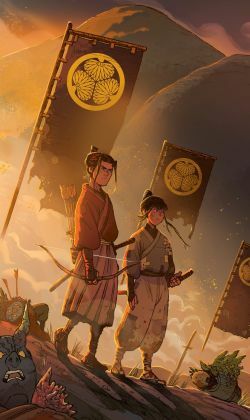 Ronin Island is a new five-issue limited series from writer Greg Pak (Firefly, Star Wars, Mech Cadet Yu) and artist Giannis Milonogiannis (Old City Blues) that examines how we move forward when our past divides us, set against the backdrop of a post-disaster Feudal Japan. Dynamic Forces: Greg, tell us the genesis of your new miniseries for BOOM! Studios, Ronin Island. Greg Pak: I had a tremendous time working with editor Cameron Chittock on Mech Cadet Yu, a BOOM! Studios series that was probably my most favorite thing to work on in 2017 and 2018. And at some point as we were finishing that series, we started talking about other possible projects to collaborate on. Cameron tossed out martial arts as a genre he was interested in, and that made me think about my love for classic samurai movies and comics, and the idea that became Ronin Island starting to come together in my head. I realized I’ve actually avoided telling martial arts related stories over the years. As an Asian American kid growing up in the ‘70s and ‘80s, I got very tired of seeing Asians in American pop culture almost exclusively portrayed in martial arts related roles. It felt like a stereotype to avoid to me as a younger writer. But at the same time, I freaking LOVE those classic Kurosawa samurai movies and Hong Kong kung fu epics. And I’m finally at a point where I’m like, hell, this stuff is awesome and I should give myself permission to embrace it and finally play in this genre, but bring my own specific spin to it. And that’s what we’re doing, and it’s been a total blast! DF: When you talk about world-building, this finite series is, as Andy Griffith used to say, “packin’ ten pounds into a five-pound bag”. What can you tell us about the backdrop of the world – okay, and the island – on which this takes place? Sounds like it itself is a character of sorts. Greg Pak: Our story takes place in a kind of alternate history 19th Century Asia in which a terrible, mysterious event known as the Great Wind swept through big chunks of Japan, Korea and China and devastated the population. Our heroes live on an island off the coast of Japan where a small number of survivors from Japan, Korea and China came together in the wake of the Great Wind to form a new society. So as our story begins, the island is almost a little utopia, a pan-Asian democracy of folks who over the course of a generation have, on the surface, settled past differences to come together and build a new world for themselves and their children. DF: Tell us what you can about your main protagonists, especially Hana and Kenichi. Greg Pak: Kenichi is the privileged son of one of the founders of the island and the descendent of a long line of samurai. Those class distinctions ostensibly shouldn’t matter any longer on this island of survivors, but of course they still do on a certain level. So Kenichi starts off our story on the top of the heap, but he’s got his own problems. His father is dead and he’s under a lot of pressure to step up and be the samurai he thinks he has to become. Is he up for the task? And is that even the right goal to have? We’ll see! Hana is an orphan, the daughter of Korean farmers. She lives alone on the margins of the main town and she’s got a bit of a cynical attitude about the island. She and Kenichi are the community’s best young warrior students, but she doesn’t have any particular illusions that she’ll have the same opportunities as Kenichi as an adult. So she’s got a big emotional arc as she measures her commitment to the island as crisis strikes. DF: Can you introduce us here to any other characters of import, at least in a thumbnail manner? Greg Pak: Other key characters include Master Ito, Hana’s and Kenichi’s teacher; Elder Jin, the tough, canny Chinese woman who’s the elected leader of the island community; and General Sato, a hard-edged samurai who arrives and demands the island’s fealty to a mysterious new Shogun on the mainland. DF: Devil’s advocate Q: Is the “mysterious attack (that) devastates a great swath of 19th century Japan, Korea and China” [solicit copy] just a MacGuffin or will its cause come back to bite the reader in the limited series? Greg Pak: Oh, yeah. It’s critical to the whole story. The Great Wind created this whole world, so almost everything that happens relates to it in some way. And without spoiling too much, our heroes are going to face a terrible, monstrous threat that we’ll ultimately learn is related to the Great Wind. Exactly how and what that means for our characters and the world is a mystery that we’ll reveal bit by bit. But it’s a new take on a classic kind of monster with a basis in an actual scientific phenomenon that I think folks are gonna get a big kick out of. DF: I know you don’t like discussing subtext since it should be a personal thing between book and reader, but say just a few words, won’t you, about the importance of moving forward when we are divided so greatly by our past? Greg Pak: I’m always compelled by stories that explore diversity within diversity, that look at the complications within communities and groups and families. So I’ve loved this chance to dig into the points of both division and allegiance in this pan-Asian community. DF: Besides “Greg Pak,” two other words making this mini great: Giannis Milonogiannis! Discuss. Greg Pak: Giannis is tremendous. He clearly adores all the same manga and samurai movies I grew up reading and watching, and he’s a demon for detail, making this world feel lived-in and real. He’s also doing such a great job with all the little character beats, which are so crucial to this story. As just one tiny example, he does beautiful work with Hana and a little cat in the opening pages of the first issue that do so much to establish character and make us fall in love with this world. DF: Greg, wassup in new projects land? Greg Pak: Oh, so much! Right now we’re finishing up The Princess Who Saved Her Friends, a new children’s book I’m doing with Jonathan Coulton, Tak Miyazawa, Jessica Kholinne and Simon Bowland, which folks can pre-order right now at https://the-princess-who-saved-her-friends.backerkit.com/hosted_preorders ! I’m also writing Firefly for BOOM! Studios, some Star Wars books and the Hulkverines miniseries for Marvel, James Bond 007 for Dynamite, and a couple of secret projects I’m hoping to reveal in the next couple of months. More as always at gregpak.com and twitter.com/gregpak . Dynamic Forces would like to thank Greg Pak for taking time out of his busy schedule to answer our questions. Ronin Island #1 from BOOM! Studios hits stores March 6th! BATMAN/SUPERMAN #1 FIRST PRINTING GOLD SIGNATURE SERIES SIGNED BY GREG PAK!